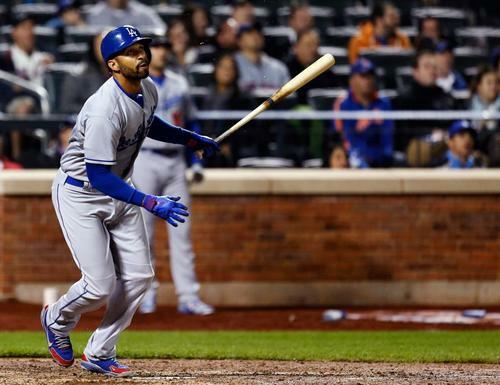 Check out this great photo of Kemp's post-home run swing. Pic via Dodgers on tumblr. I don't want to talk about the Dodgers loss last night, so check out Eric Stephens at True Blue LA's post about it instead. Matt Kemp hit a homer! Yeah!!!! Check out a video here. Jerry Hairston Jr. visited the MLB FanCave yesterday. Paul Casella at MLB.com has the story. "We don't panic. We're not worried," Hairston said. "We just want to focus on playing good baseball, that's all we want to do. Obviously we didn't get off to a fast start, but every team goes through certain things throughout the season and hopefully what we've gone through is just that. Hopefully we get red-hot in the months to come and, more importantly, in the second half." Shawn Tolleson will now have back surgery, via Eric Stephens at True Blue LA. Dropping like flies! 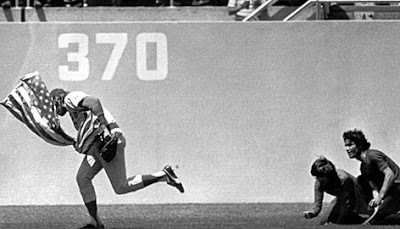 It is Rick Monday's Flag Day! Today is the 37th Anniversary of the day Rick Monday saved the American flag from the hands of a father and son team bent on destruction. As such, this is the Dodgers unofficial Flag Day holiday. Robert Edwards Auctions or REA has just put up their once-a-year auction extravaganza, and as you might suspect, it's filled with more memorabilia than you can imagine. There's vintage cards, autographs and rare artifacts worthy of inclusion into the Hall of Fame. And, there's a bunch of Dodgers collectibles that I've gathered together to show you in this post. Check them out below. BTW, if you don't already know, this firm is by far my favorite sports memorabilia auction house. They seem to always have the best quality stuff, and have shown that the use of proper ethics within the hobby can reap huge rewards. The first item is probably the best Dodgers related collectible in their whole catalog. 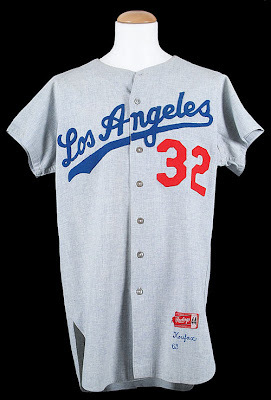 Here is a 1963 game-worn road jersey of Sandy Koufax. As you know, Sandy won both the MVP and Cy Young awards this season, so it is certainly a key Koufax collectible. Heck, it's a rarity, as well. As the auction description says, this is one of only 8 known real game-used Koufax jersey's known to exist, and 1 of only 3 graded by MEARS (a premier game-worn authenticity firm). At the time of this post it is already at $100,000.00, and I suspect it will go for much more. Here is a great oddball Jackie Robinson item. It is a 1952 Wheaties Tin Tray Proof of Jackie. The Tin Trays were originally affixed to the back of Wheaties cereal boxes, and were beveled around the edges to made a frame. 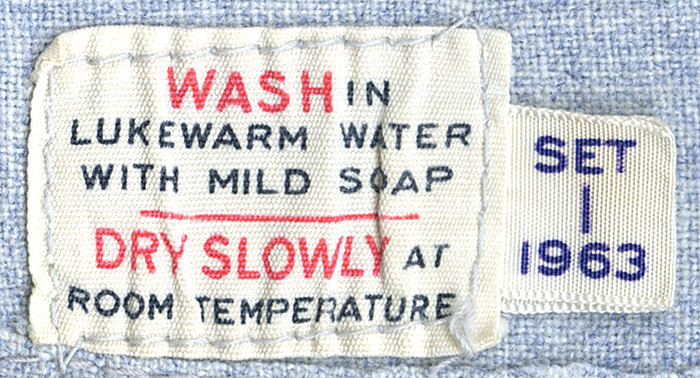 In the below example, it has not been beveled and clearly appears to have been cut from a metal proof sheet by someone involved in the production of the set. It currently sits at $500.00. 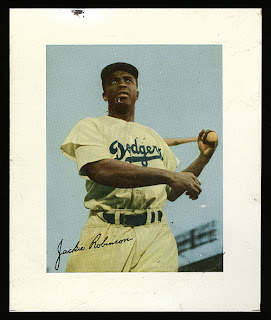 Here is another unusual Jackie Robinson collectible. 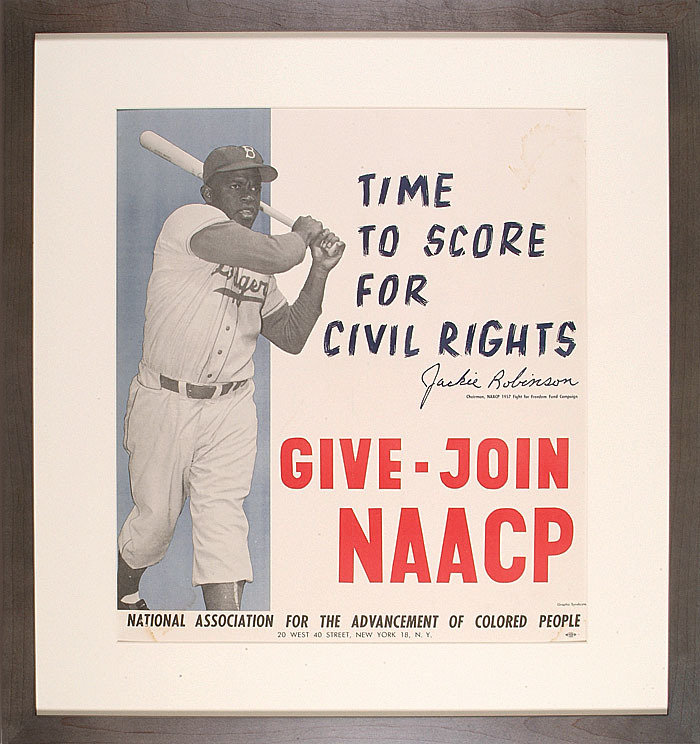 It is a 1957 "Time To Score For Civil Rights" poster featuring Jackie Robinson "going to bat" for the National Association for the Advancement of Colored People (NAACP). It originally came directly from Jackie's wife, Rachel Robinson for a 2006 auction, so it once resided within the estate of Jackie Robinson. It is currently at $3,250.00. Long since forgotten, Wilbert "Uncle Robbie" Robinson was a beloved Brooklyn manager at the start of the 20th Century. From 1914 to 1931 he captained the team to the delight of fans, as Brooklynites reveled in the error-prone machinations of their hometown boys. Soon, fans would call the team the "Robins" in his honor and delight at the wackiness of "Uncle Robbie's Daffiness Boys". The Dodgers back then were bad, so bad they were good- good for some great laughs and some better times at the ballpark. 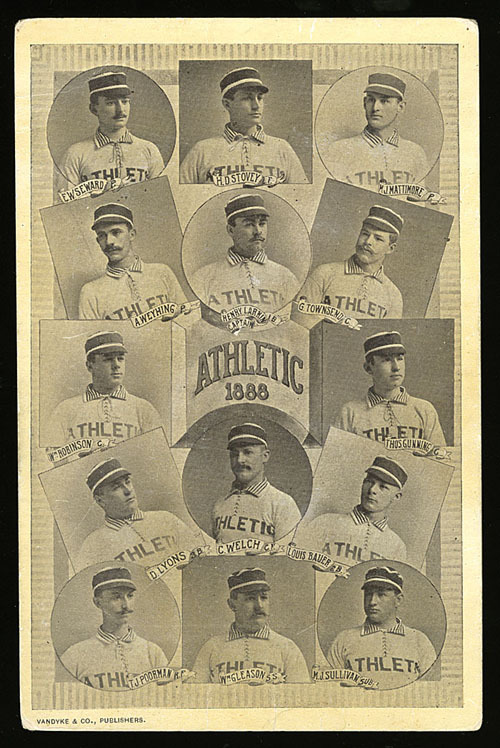 Featured below is a 19th Century team cabinet card of the 1888 Philadelphia Athletics, and shown on the middle row, far left is a young Wilbert Robinson. This cabinet card measure 4.25" x 6.5". It is currently at $1,600.00.